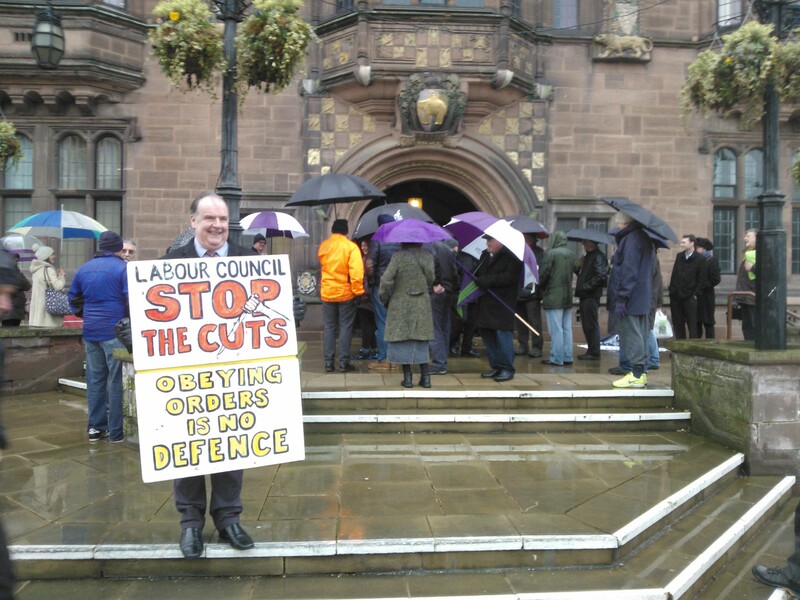 Despite the pouring rain, around 40 people joined the lobby of Coventry Council on Tuesday 13th to challenge councillors over their planned budget cuts. The cuts will mean every service outside the City Centre is under threat of closure – every library, community centre and even public toilets! Members of unions such as Unite, Unison, NUT and the FBU were represented, as well as Coventry Trades Council. Socialist Party members and Trade Unionist and Socialist Coalition (TUSC) candidates were also at the lobby. Former Labour MP and Socialist councillor Dave Nellist, national chair of the Trade Unionist and Socialist Coalition, called on the council to use the £81 million they have in reserves and build a campaign against the cuts. He also said the council should be flooded with petitions challenging every service closure so the council know people are opposed to their cuts. There will be a Coventry Against the Cuts march through the City Centre on February 21st, to put more pressure on the council before the budget vote on the 24th. If, as expected, Coventry’s councillors choose to vote for the planned cuts and decimate our services, Trade Unionist and Socialist Coalition candidates will stand in every ward across the city to provide an anti-cuts alternative in May. #CovBudget2015 – Public Consultation… With No Councillors!